Back in January I was lucky enough to go to Seattle for the Pop Punk Festival that Ean from Sicko put together. It was a great time with a lot of cool bands playing. For me, no highlight was higher than finally getting to see Bum play live after over 20 years of waiting. They were the number one band on my list of bands that I'd never seen live and that show was everything I could have hoped for and more. Their setlist contained nearly all of Wanna Smash Sensation, which is one of my favorite records of all time. They also had a few copies of this Japanese version of the CD with two bonus tracks for sale. As a crazy completist, of course I had to buy a copy. I'm not kidding when I say this is one of my favorite all time albums, handily in my top ten desert island whatever you want to call it. It's pretty much a flawless record and trying to dissect each song would be quite the task, likely leading to a review a bit longer than a normal person would want to read. It's the epitome of the early nineties, fired up poppy punk record. Hooks galore, incredible vocals and a songwriting duo unrivaled in my generation. From the opening blast of Debbiespeak, to the singalong anthem of "Wedding Day" to the horn tinged pop of "Bent of Being Bent" to the absolute perfection of "I Hardly Breathe" to the party anthem of "I'm Not One," Wanna Smash Sensation has all of your bases covered. These songs are part of my life's soundtrack and I love every single one of them more than I could really articulate in a brief review like this. I didn't even mention how incredible songs like "Mallory," "Instant Kool Ayd" or "a Promise Is A Promise" are. Just look at the track listing and randomly pick a song, you could make an argument that it's the best song on the record. They are all that good. This Japanese version differs from my other copies in that it contains two bonus tracks. The first is "Lift Up Your Hood" a DMZ cover that was also available on the Bum split 7" with the Smugglers. The second is a cover of the Misfits song "Bullet." This one I had in my collection from its appearance as a B side on the "Debbiespeak" 7". 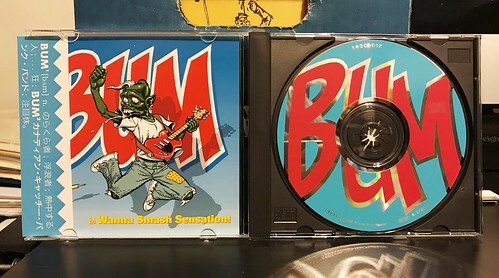 So, while neither were new songs to me, this CD was still one that had to be in the collection. After all I am a sucker for an Obi strip. In all seriousness, you should own this record in any version that you are able to find. I cannot say enough good things about it and I really don't think you can really understand how much I love it just from this silly review. It's perfect. A flat out perfect album. Go find one.